We’ve been planning our Florida holiday this weekend – namely, places where we plan on eating! We started talking about our favourite restaurants out in Orlando, and remembering the meals we’ve enjoyed Stateside. 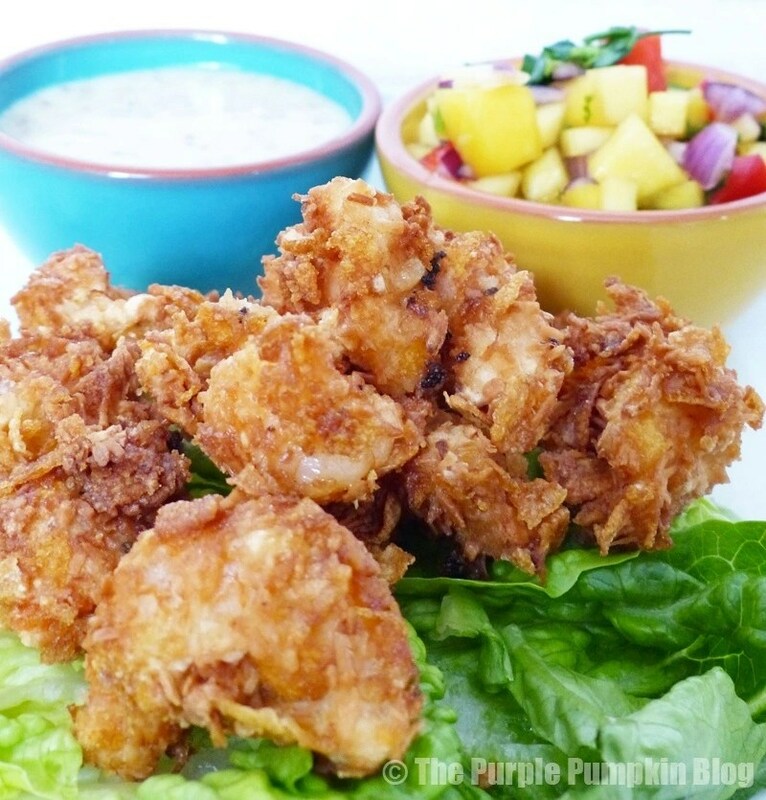 One dish I always order on holiday is coconut shrimp – much to my son and husband’s dismay as they really hate coconut! 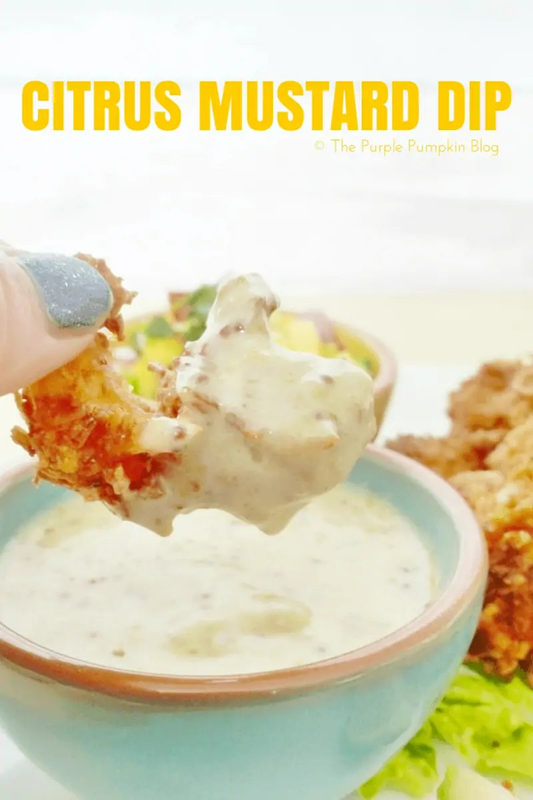 In the past, I’ve made homemade chicken nuggets before, coating the chicken in crushed cornflakes instead of breadcrumbs – it gives the a tasty, satisfying crunch; and I thought it would transfer well to shrimp too. I did a quick search online to see if I could find a copycat recipe, and the restaurant that we love dining at in Orlando, actually had recipes on their website! I looked through all the recipes, but sadly, there wasn’t one listed for their coconut shrimp (probably too much of a secret!! ), but fortunately, there was a recipe for the citrus mustard dip that goes with them. They also had their mango salsa recipe, which is like sunshine in a bowl, so I decided to make that too. I scribbled down the ingredients for the dips and realised I’d have to substitute a few as I knew I wouldn’t be able to buy some of them in the UK. For the shrimp coating, I’d need a box of Kellogg’s Cornflakes, flour, eggs and desiccated coconut. 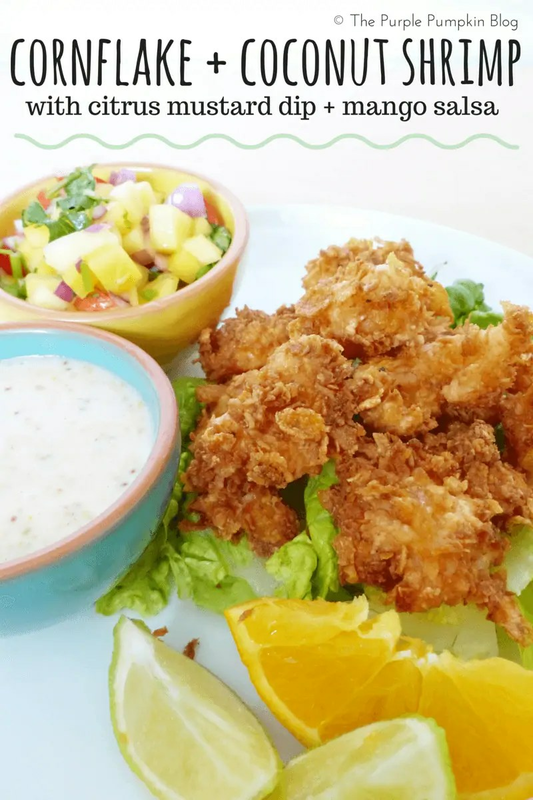 One trip to the supermarket later and I had all I needed to make my Cornflake and Coconut Shrimp with Citrus Mustard Dip and Mango Salsa. 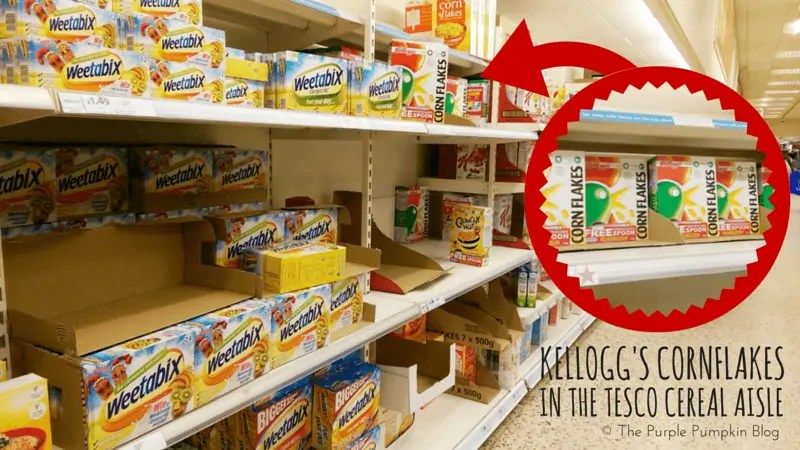 At our local Tesco, the back wall is one long cereal aisle, shopping on a Friday evening meant that some of the shelves were empty, but there were boxes of Kellogg’s Cornflakes available, so I grabbed a box of those and proceeded to buy the other things for my dish. I mentioned substitutes earlier, one was using wholegrain mustard instead of Creole mustard – a search online told me that it was the nearest thing to use; and the other was Cajun seasoning instead of Creole seasoning. Since Cajun and Creole are from the same area, I figured that it wouldn’t harm my recipe too much! You will need a food thermometer to gauge the temperature of the oil for deep frying which is 190C/375F. If you don't have one, you can test the oil by dropping in a 2cm/1" cube of bread, it should take around 60 seconds to go brown. De-vein the prawns by running a knife carefully along the edge and pulling out the dark vein. You can also butterfly the prawns if you wish. Crack the eggs into a bowl, and beat with a fork. In another bowl, place the flour and Cajun seasoning and mix together. In a third bowl, crush the cornflakes with your hands to make smaller pieces, and stir in the coconut. To coat the prawns, first dip into the egg, then into the flour, then back into the egg, before a final coating with the cornflake and coconut. Place on a tray whilst you prepare all of them. In a deep saucepan (or a fryer if you have one) heat the oil for deep frying. See the notes above for help and advice. Carefully place 4 - 5 coated prawns into the oil using a pair of tongs and fry for 1 - 2 minutes until pufffed, golden and cooked through. Remove from the oil and place on a plate lined with kitchen paper to drain. Continue until all the prawns are cooked - don't over crowd the pan as this brings the temperature of the oil down. Serve immediately with citrus mustard dip and mango salsa. 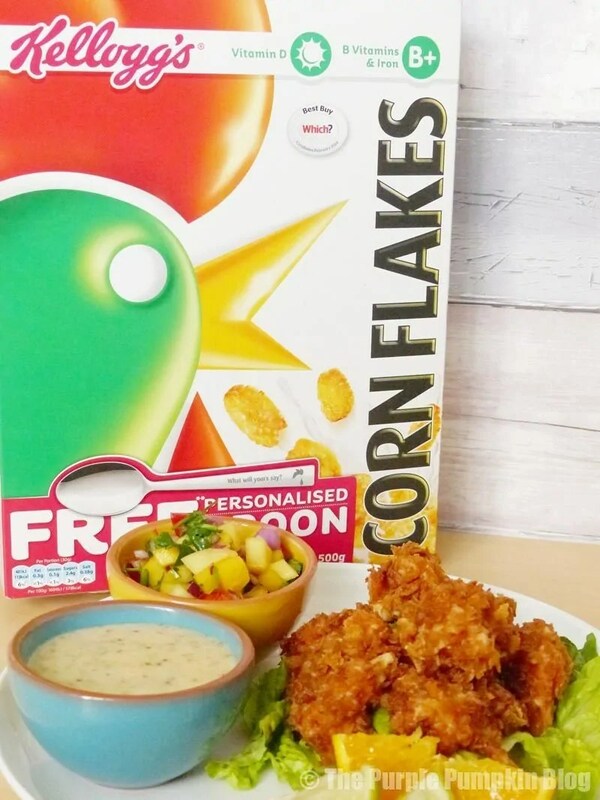 Making the cornflake and coconut shrimp is a bit of a production line as you have to dunk the prepared raw prawns into beaten egg, seasoned flour, back into the egg and then finally into the cornflake and coconut coating…before deep frying. I coated half of my prawns in plain cornflakes for the fussy ones! Your fingers will get sticky as you dunk the prawns, but the end result is worth the mess! Lay the coated prawns onto a baking sheet or a grill pan as you prepare them, then get the oil ready for deep frying. Deep frying food is serious business, so always use a deep saucepan, do not fill more than half of the pan, and give yourself around 10cm/4″ of pan above the oil. Do not drop food into the oil, place it in gently, laying the food away from you – using tongs preferably. Keep an eye on the temperature of the oil with a thermometer (190C/375F for deep frying), and do not overcrowd the pan. Place cooked food on a plate lined with kitchen paper to absorb excess oil. In case of fire, place a damp towel over the pan to snuff out the flames – do NOT use water. I don’t wish to scare you away from deep frying, as it is something you can do at home, but please read these tips if you have never deep fried food before. I made two dips to go with my cornflake and coconut shrimp: Citrus Mustard Dip and Mango Salsa. I made them in advance so that we could eat the shrimp hot from the fryer. Taking inspiration from my favourite dish at an American restaurant, I tweaked to my taste, and as I always say, you can do the same too…. you may like things a little more or less spicy! Place the marmalade into a bowl, and mash with a fork. Add the mayonnaise, horseradish, mustard and lime juice and whisk together until smooth. Add the Cajun seasoning to taste. 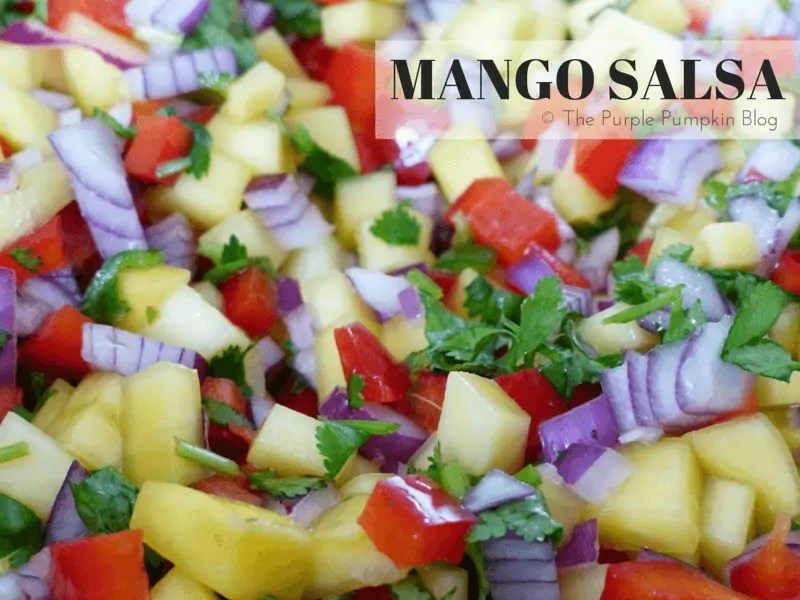 Place the mango, chilli, bell pepper, onion and coriander into a bowl and mix together until well combined. Pour over the lime and orange juice and stir. Season with salt. When I share recipes on my blog, you always have to take my word for it when I say that the end result was delicious – and these shrimp were no exception! The cornflakes gave them a wonderful crunch, and you could taste the coconut in the coating too. The ‘plain’ ones were just as good, so if you have coconut haters like I do, then they are not missing out! This dish took us right back to sunny Orlando with each bite, and I’m so glad that I made this copycat recipe – it makes our favourite holiday destination feel that little bit closer!